A team of physicists at the University of Basel have gone beyond studying the basic structures of biology, as structure alone is inadequate to fully understand the function of native and engineered biomolecules. The investigators in this new study uncovered a novel method to examine the elasticity and binding properties of DNA molecules on a surface at extremely low temperatures. Findings from the research team’s work—published today in Nature Communications through an article titled “Conformations and cryo-force spectroscopy of spray-deposited single-strand DNA on gold”—used a combination of cryo-force spectroscopy and computer simulations to show that DNA molecules behave like a chain of small coil springs. DNA is not only a popular research topic because it contains the blueprint for life, but it can also be used to produce tiny components for technical applications. In a process known as DNA origami, scientists can manipulate the genetic material in such a way that folding the DNA strands creates tiny two- and three-dimensional structures. These can be used, for example, as containers for pharmaceutical substances, as conductive tubes and as highly sensitive sensors. To be able to form the desired shapes, it is important to be familiar with the structure, the elasticity and the binding forces of the DNA components being used. These physical parameters cannot be measured at room temperature, because the molecules are constantly in motion. However, the same is not true at low temperatures. In the current study, the research team used cryo-force microscopy for the first time to characterize DNA molecules and examine their binding forces and elasticity. 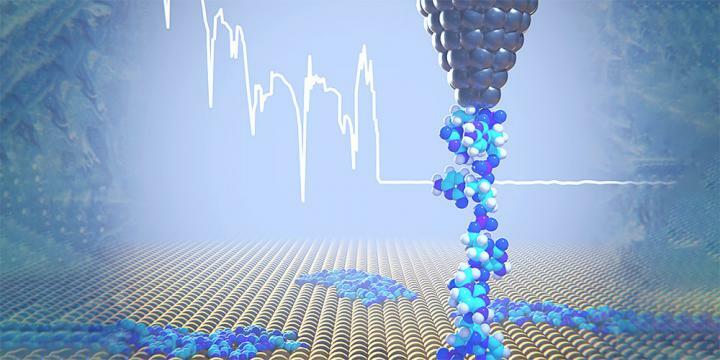 The scientists placed only a few nanometers long DNA strands containing 20-cytosine nucleotides on a gold surface. At a temperature of 5 Kelvin, one end of the DNA strand was then pulled upwards using the tip of an atomic force microscope. In the process, the individual components of the strand freed themselves from the surface little by little. This enabled the physicists to record their elasticity as well as the forces required to detach the DNA molecules from the gold surface. “The longer the detached piece of DNA, the softer and more elastic the DNA segment becomes,” explained lead author Rémy Pawlak, PhD, a scientist at the University of Basel. This is because the individual components of the DNA behave like a chain of multiple coil springs connected to one another. Thanks to the measurements, the researchers were able to determine the spring constant for the individual DNA components. Interestingly, computer simulations clarify that the DNA is detached discontinuously from the surface. This is due to the breaking up of bonds between the cytosine bases and the DNA backbone from the gold surface, and their abrupt movements over the gold surface. The theoretical elasticity values correlate very closely with the experiments and confirm the model of serially arranged springs. In all, this study confirms that cryo-force spectroscopy is very well suited to examining the forces, elasticity, and binding properties of DNA strands on surfaces at low temperatures.